:For full details in different games, see 1P Game, Classic Mode (SSBM), Classic Mode (SSBB), Classic Mode (SSB4-3DS), Classic Mode (SSB4-Wii U), and Classic Mode (SSBU). Classic Mode as seen in Brawl. Classic Mode (シンプル, Simple), known as the 1P Game in Super Smash Bros., is a single-player campaign mode that has appeared in every installment of the Super Smash Bros. series. The many incarnations of this mode vary in terms of number of stages, order, and options available but generally feature a series of VS Mode matches leading up to a boss fight at a pre-selected difficulty. In the original, the player fought in a predetermined order: the player would always fight a specific character at a certain stage in a fixed order under static conditions. In Melee, randomization elements were introduced — the battles and the order in which they take place are, for the most part, completely random (other than the basic layout, which is elaborated upon in the below section). Additionally, the Board the Platforms bonus game was removed for Melee, replaced by Snag the Trophies. In Brawl, Snag the Trophies and Race to the Finish were both removed to make room for the second Target Smash! round. 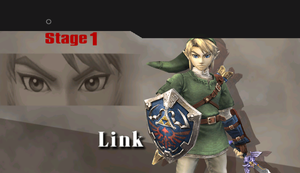 Additionally, the matches are no longer as randomised as they were in Melee; each stage has a theme and is based on at least one universe (for instance, Stage 1 is based on The Legend of Zelda), where characters and sometimes stages are chosen by random, provided they match the theme. If the player loses all their stock, they are brought to the Continue screen with the respective option. Some coins - the number of which varies depending on the difficulty level — and half the points are lost if "Yes" is chosen, but a "GAME OVER" is shown if "No" is chosen or if the player does not have the required amount of coins. If the player is defeated in Classic Mode in Super Smash Bros. for Wii U, some of the prizes are deducted. In Super Smash Bros. for Nintendo 3DS, instead of a singular path, the paths branch out, giving the player a choice as to who to fight next. These paths are color coded: red is hardest and yields the most coins, green is medium, and blue is the easiest, yielding the least coins. In Super Smash Bros. for Wii U, players do not have the choice of paths; rather, they advance based on skill levels. Classic mode returns for Super Smash Bros. Ultimate. This time, each character has their own roster of opponents and stages. A unique name is given on the match screen, and the character’s path is often themed around them, such as Ryu fighting against Zero Suit Samus with Chun-Li's theme. There is also a bonus stage, as well as additional bosses. Classic Mode introduces different types of battles as the player progresses. In Melee, there is one type of each battle in a set stage, while in Brawl there are multiple special battles fought randomly in each stage. In a regular battle, the player engages in a one on one battle with another character. These type of battles are the most common type of battle in Super Smash Bros., Melee, Brawl, Smash for 3DS and Ultimate. The opponent is usually chosen at random and is battled on their home stage, except in Smash for Wii U where the stage is chosen at random. In Ultimate there is no random battle selections due to the fact that all classic modes are predetermined. Ryu is the only character to have stamina battles in his route. In a team battle, the player pairs up with a computer ally and battles two other computer opponents just like battling against the Mario Bros. in the original installment's 1P Game mode. The higher the difficulty, the less reliable the ally will be. In Melee, the player fights a team of two opponents on stage 2 along a randomly selected ally (except for Zelda, Sheik and Roy). The opposing team is randomly selected from a predetermined list. The ally's launch resistance depends on the difficulties - the higher the difficulty, the lower the allies' launch resistance and AI level. In Brawl, universes with at least two character slots (therefore Samus and Zero Suit Samus do not qualify as two transformation characters cannot exist on stage at the same time) can be fought in a team battle along a randomly selected ally from the stage's featured universes. Two team battles are always encountered in a single playthrough. In the 3DS version of SSB4, some paths may have two opponents during stages 1 and 2. Player will fight them alongside a randomly selected ally. In the Wii U version of SSB4, a team battle may be fought (if the amount of opponents are right for one) alongside a player selected ally (among defeated characters). Some stages may feature multiple teams or more than two characters per team (if the stage allows more than 4 players where they will be in its 8-Player Smash varation). In Ultimate, most Classic Mode routes lack a team battle. However, some characters such as Donkey Kong, and Chrom are based on team battles, and may even include teammates in boss battles. Computer teammates will not appear if there is a second player. In a giant battle, the player pairs up with at most two allies and battles a giant character. The giant character will have the same attributes as a character under the effects of a Super Mushroom; however, the enlarged size will last the whole battle. The giant character can usually sustain more damage and has more powerful attacks, but their jump distance is reduced and they become a bigger target. The higher the difficulty is, the less reliable the computer allies will be. In Melee, giant fights occur in stage 5, where a character will be randomly chosen from a predetermined list of eligible characters. The player is given two allies again during the giant battles just like in the original installment's 1P Game mode when Battling against Giant Donkey Kong. In Brawl, however, any character except for The Legend of Zelda characters on stage 1, and for the Donkey Kong characters on stage 2 is eligible as a giant opponent. This battle is chosen at random by series and the player will be given a certain number of allies depending on the stage number. When this battle is chosen on stage 2, two allies will fight alongside the player. When it is chosen on stages 3, 4, and 5, only one ally will fight alongside the player. Finally, when chosen on stages 6-10, the player will fight alone. In Smash for 3DS, any character is eligible as a giant opponent by choosing any path. When this battle is chosen on stages 2 or 3, one or two allies will fight alongside the player. Finally, when chosen on stage 4 the player will fight alone. In Smash for Wii U, any character that's not a Mii can be fought as a giant opponent, provided they appear as an intruder. Most battles in Ultimate lack a giant battle, but a select few characters such as Luigi have a few giant battles. In a multi-man or horde battle (refers to "Team (character)"), the player fights multiple copies of another character. The opponent team will usually attack in groups of three, but they have lower handicap than usual, making them easier to get KO'd by the player and more difficult for them to KO the player. In Super Smash Bros., the multi-man battles are: 18 Yoshis (Stage 2), 10 Kirbys (Stage 7) and the Fighting Polygon Team (Stage 10). In Melee, Brawl and Smash for 3DS, the player fights 10 copies of a character. CPU's will not use the same color what the player chose if the player faces off 10 copies of the character picked. In Brawl, 25 playable characters may be fought as multi-man opponents. Exceptions In Brawl are The Legend of Zelda characters on stage 1, Yoshi and the Donkey Kong characters on stage 2 and the Pokémon characters on stage 3. In both versions of SSB4, the player fights a number of Miis (10 in Smash for 3DS and 20 in Smash for Wii U). All Miis' faces are generated from the player's console, along with Guest Miis if none exist. In Smash for 3DS, the player can also fight against multiple copies of a character by choosing one path on stage 5. In Ultimate, multi man battles are uncommon but some characters such as Marth and Mega Man will use the format. In a metal battle, the player faces an opposing computer player under the effects of a Metal Box for the entire battle. A metal character can sustain more damage without being launched and are less likely to flinch, along with having more powerful attacks. However, their falling speed is increased and running speed reduced. In Super Smash Bros., the player fights Metal Mario in Stage 9. In Melee, a metal battle is always fought on the Battlefield stage and with no items appearing at all unlike Adventure Mode. Every opponent eligible for a one-on-one is eligible for a metal fight (it can be anyone except Roy, Ganondorf, and Mr. Game & Watch). In Brawl, however, the metal battles are chosen at random by series starting from Stage 6 and items are present for the first time since Melee's Adventure Mode. In Smash for 3DS, any character is eligible as a metal opponent by choosing any path on stages 3 and 4 and lastly, in Smash for Wii U, any character that's not a Mii can be fought as a metal opponent, provided they appear as an intruder. A metal battle in Ultimate is very rare, but characters such as Bowser and Sonic will encounter such battles. This new type of battle is introduced in Brawl. In that game, it appears as the second to last battle. In this battle, the player must fight three random characters (who haven't been fought yet in the current playthrough) on Final Destination. Due to the AI prioritizing human players over computer players in Brawl, the opponents in this match will focus on attacking the player. The music played in this battle is Opening (Super Smash Bros. Melee). In the 3DS version of Smash 4, this battle returns as a random battle in three to four stages of the mode. In this game's battle, the player must battle three random characters on the first CPU's home stage designated by series. The Wii U version heavily focuses on this type of battle, when the player must battle more random characters than three. The Al is the same as the previous installment. Free-for-all battles return in Ultimate, but are notably rare. A few characters such as Pichu and Isabelle have free-for-all battles. This is usually the final stage. Traditionally the players faces Master Hand on the Final Destination stage. When one player reaches the final stage in this mode on at least Normal below 15 minutes (in Melee) or at least Hard within 9 minutes (in Brawl) without using any continues, Crazy Hand will fight alongside Master Hand. However, there are no items at all during this battle. Master Hand and Crazy Hand both have a certain number of hit points (depending on the difficulty the player chose) that must be depleted to clear this mode. In Brawl, the difficulty also influences the hands' movement. The higher the difficulty, the faster they move. In Melee, Crazy Hand will appear after the player manages to reduce Master Hand's HP by half. In Brawl, Smash 4 and Ultimate, Master Hand and Crazy Hand will both appear at the start of the fight. The mechanics are completely different in Smash for 3DS / Smash for Wii U. Although both Master Hand and Crazy Hand return and are announced as the final battle together, they make up only a single form of the true final battle against Master Core, a multi-stage boss with powerful and hard-to-dodge moves. All bosses in the final battle share a common health pool, with form changes and defeat occurring at fixed percentages. It is recommended that players use highly optimized custom equipment when taking on difficulty 9.0 due to the length and difficulty of the final battle. In Smash for 3DS, the player is given a choice of paths between Master Hand alone (easy) or Master Hand and Crazy Hand (hard). Higher difficulties turn the hard route into a battle against Master Core. At very high difficulties (8.0 to 9.0), the player has no choice but to fight Master Core and all its forms. In Smash for Wii U, Master Hand will always appear as the final battle. Crazy Hand appears from the mid-low difficulties and upwards. Higher difficulties turn it into a battle against Master Core. Starting at 8.0, Master Core gains an additional phase in Master Fortress, a maze filled with powerful minions and hazardous surfaces where the player has to destroy its weak points to win. In Ultimate, the boss fought depends on the player character and is not always Master Hand. For example, Mario and Captain Falcon faces Giga Bowser and Kirby fights Marx. Sometimes the boss is fought before the final stage. For example, Mega Man fights Galleom in the round before fighting Dr. Mario and Mewtwo (as a nod to Wily's alien form from Mega Man 2). Some fighters don't face any bosses at all, such as Jigglypuff, who fights Giant Donkey Kong. The music that plays when Brawl's Classic Mode is cleared. This page was last edited on April 23, 2019, at 13:01.